Last week I looked into why knee pain is so common and how the Bar Method can help students who have knee issues. To recap, if your knees hurt because of ligament damage or moderate arthritis, The Bar Method workout can help you regain stability in the joint by strengthening and balancing the major muscles that extend across your knee, principally your quads, calf muscles, and hamstrings. – Instead of the narrow V position, do “parallel thigh.” If needed, bend your knees to a lesser extent as I’m showing in the photo. This adjustment prevents your stronger outer quad muscles from over-engaging. In this position you can also squeeze a ball, small mat or cushion between your legs to help strengthen your inner quads (see last week’s blog for details). – Instead of bent-knee standing seat, do straight knee standing seat. Under normal circumstances standing seat is a great stretch for the quad muscles, which have just been worked. The reason the exercise might be uncomfortable for you is because your outside leg muscles might be not only stronger but also tighter than those on the inside and so are pulling your kneecap outwards. 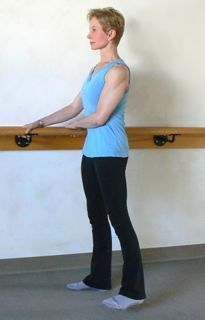 Until your leg muscles regain more evenly balanced strength and length, simply keep both legs straight in this exercise. Meniscus tears: You have two menisci in each knee. They’re a kind of cartilage but with a specialized cushioning and stabilizing ability. A sudden twist is what often tears a menisus, usually causing enough pain and disability to need medical treatment before you return to exercise. When you do come back to class, after your initial treatment the exercises can help you strengthen your knee if you take it easy at first. Patellar tendonitis: Your patella or kneecap kind of floats inside your quad tendon, a big tendon that extends across your knee and fastens to your shinbone. (Your kneecap itself has a smaller tendon of its own.) Patellar tendonitis, which you get when these tendons become inflamed, is a stubborn condition that doesn’t go away easily. It causes pain and swelling in the front of your knee when you bend it. If you have this condition, some thigh exercises will be uncomfortable for you. Hamstring tendonitis: You have three hamstring muscles, the tendons of which stretch across the back of your knee. These tendons can also become inflamed (another obstinate problem) and cause pain in the back of your knee. Obstruction in the knee joint: Your knee might have an obstruction in the joint due to a piece of cartilage, menisci or other tissue stuck between the bones. Obviously in this situation you wouldn’t be able to straighten your knee without a lot of pain. Greater than average “Q angle”: Women’s “Q angle,” that is, the angle between the quad muscle and the patellar tendon, which is greater than mens’ due to a wider pelvis. Women’s knees are beset by this issue because evolving humans found it to their advantage to produce ever smarter babies with bigger heads. Women’s knees have as a result ended up with “a narrower femoral notch, increased ‘Q angle,’ and increased ligamentous laxity” according to James A. Nicholas, M.D., the founding director of the Nicholas Institute of Sports Medicine and Athletic Trauma, thereby making women’s knees inherently more vulnerable to injury. 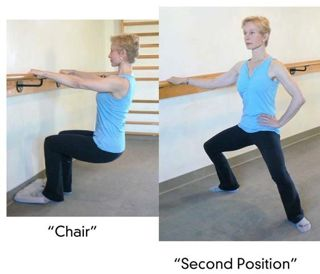 – Instead of parallel, leg-together and narrow V thigh work, do “chair.” This position keeps the feet flat on the floor and the knees right over the ankles. It’s also great for distributing the effort from your quad muscles evenly across your knees. – Instead of “diamond thigh” and “second position,” both of which are performed in a wide turn-out, do “second position” with your feet flat on the floor. Like chair, this position allows you to keep your heels down and your knees over your ankles. – When all else fails, you can always do leg lifts during thigh-work. Leg lifts work your thighs with no weight on your knees. You can do leg lifts both in a parallel position and with your legs turned out (always keep your leg directly in front of your hip, whether the leg is “parallel” or turned out). – Your knees might be simply sensitive, or you may not be able to bend them completely. In these cases, you can modify the leg stretches in a number of ways. Here are two modifications for example that you can use during the thigh-stretches. – Throughout the whole class anyone with limited flexion in a knee can keep it straight during any stretch or perform the stretch standing while holding onto the bar. In the long run, finding a way to workout rigorously without joint pain will help your knees. In my view the Bar Method is an ideal workout choice first of all because its tight structure enables you to anticipate each next position and adjust accordingly, and also because its modifications accommodate as many knee issues as possible. Find Bar Method Exercise Classes near you. Sample and buy Bar Method Exercise DVDs.